Studs & spikes are so in right now. I'm sure you've seen them on jewelry, shoes, handbags, clothing and now you'll get to see them even more! Coming soon to Cocoa & Hearts, a NEW series called 'Backstage' - where you'll be introduced to several ROCK STARS, new & old. It's an interesting twist, bringing a little FASHION directly into the art - I think you'll enjoy it! Have a nice weekend. I can't wait to see more from your "Backstage" series! Your one very talented lady! Thank you girls, im really excited to get these up on the site! 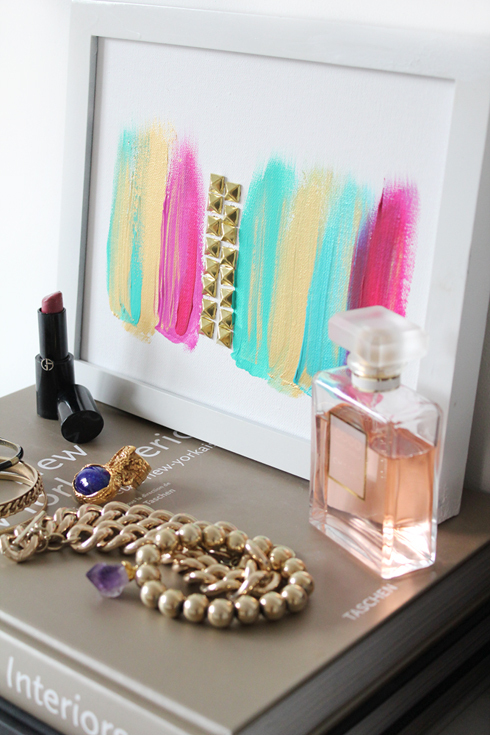 I never would have thought of putting studs on canvas! Love it. You are so creative. I never would have thought to put studs on canvas. Love it! What a brilliant and TOTALLY original idea and so "Made By Girl". You def. are an artist in your own right and I wish you much success! omg! I really REALLY want that Valentino tote! Ahh, love your new painting!!! I like this fun twist on the art! She is a genius! Can't wait Jen whatever it is you just know it's going to be fab! Oh and those shoes..... to die for! WOW, THIS necklace with the rock is gorgeous! What kind of the rock is that? The color is amazing. So original painting, bravo Jen! love love it! Adorable!! Such a great idea... can't wait to see the finished products! Excellent idea Jen!!! Love your art, your blog, you are great inspiration for me!! I'm spiked obsessed and I think I need that painting. I love love love my spiked Sam Edelmans. My favorite is to pair them with ultra girlie lace. What a great idea! These are going to be gorgeous!! I love studs, so am always happy when they are back in. Looking forward to see what other fashion art twists you have up your sleeve! Very cool. Can't wait to see!! What a fab idea - LOVE studs! I posted about my current love for studs a few weeks ago! Hi Jen, I saw your copy cat warning! Good for you and shame on those people. I'm glad you caught them, but I was wondering how were you able to catch them. I know you are so busy, it would just so impossible to even begin to know where to look and how to possibly stop it. Love this new addition to Coccoa and Hearts!!! So stinkin' cute!!! I just created a ost on spikes and studs too! Awesome! I cant wait for that to come to Cocoa & Hearts! Such perfection! You are genius!! LOVE the added studs!! Can't wait to see more paintings! Looks fabulous already! I'm so in love with that Valentino tote. ... I actually saw an artwork made of solid stripes and studs 2 weeks ago in Montréal. It was quite similar looking, I wish I had a picture. Thanks so much! Glad you guys like it..just incorporating a bit of fashion into the mix.